Above: Mike Lynch and the winner of the Reuben Award: my friend Richard Thompson! 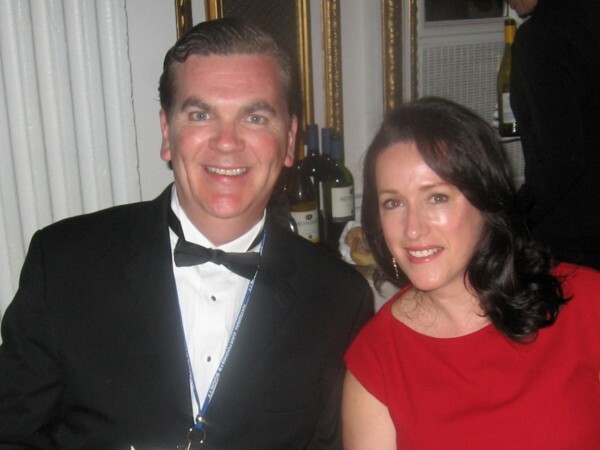 The 65th annual Reuben Awards weekend was held in beautiful, downtown Boston, at the historic Copley Hotel. 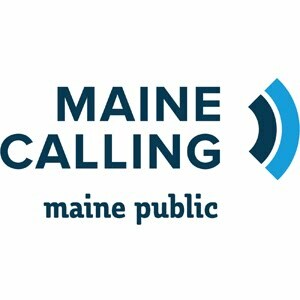 The Award winners are listed here. Now, a few photos of the hundreds of cartoonists in attendance during the 3 day event. 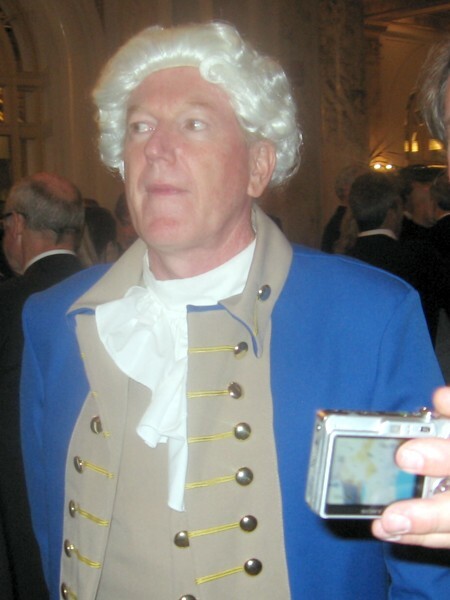 National Cartoonists Society President Jeff Keane, dressed in Revolutionary War regalia for the Awards dinner, looks askance at 21st century technology. NCS Secretary John Kovaleski and Mengxin Li, winner of last year's Jay Kennedy Memorial Scholarship. Both are lovely and talented. Mengxin's art blows me away! 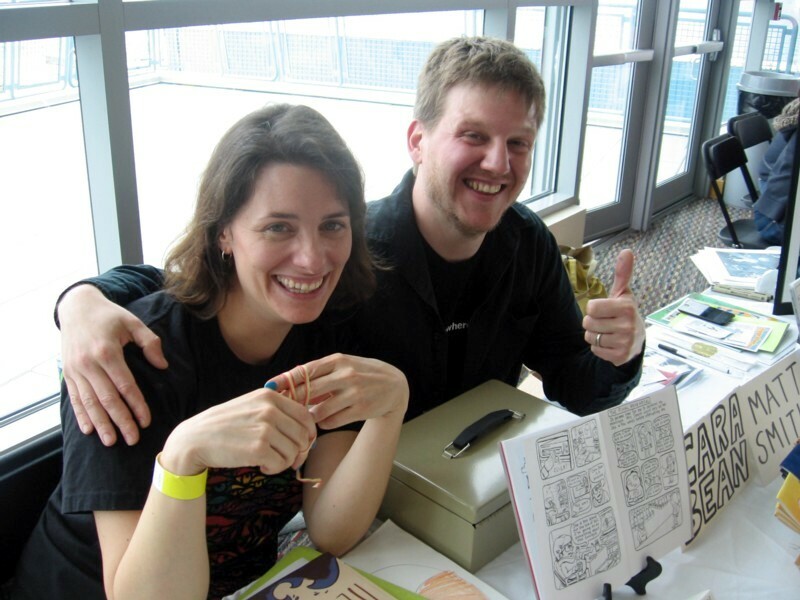 All the way from Jersey: Award winning illustrator Lori Triefeldt and Rein Triefeldt. Chapter Chairs (and my good friends) Adrian Sinnott (Long Island) and Tom Stemmle (New Jersey). These guys work hard. Shaenon Garrity, Brian Moore and Andrew Farago. Three terrific people in the comics biz. Two from The New Yorker: Zachary Kanin and Farley Katz. There was a giant shell in the ballroom and I had to have my photo taken in front of it! From left: Alexandra DiTuillio, Mike Lynch and Mengxin Li. The Aussies copy my photo concept: Jason Chatfield and Luke Watson in a serious conversation in front of that shell. Bob Rich and NCS Division Newspaper Illustration Award Winner Michael McParlane strike a pose. The Jeff Kinney seminar was SRO. Abrams Comicarts, Mad Magazine and Archie: Rachel and Charlie Kochman, Nick Meglin, Stan and Pauline Goldberg. An angle of the Reuben Awards ballroom. Another angle of the ballroom, with the stage in the background. Cartoonists clean up good. The one and only Scott Shaw! fresh from California and Mike Lynch. 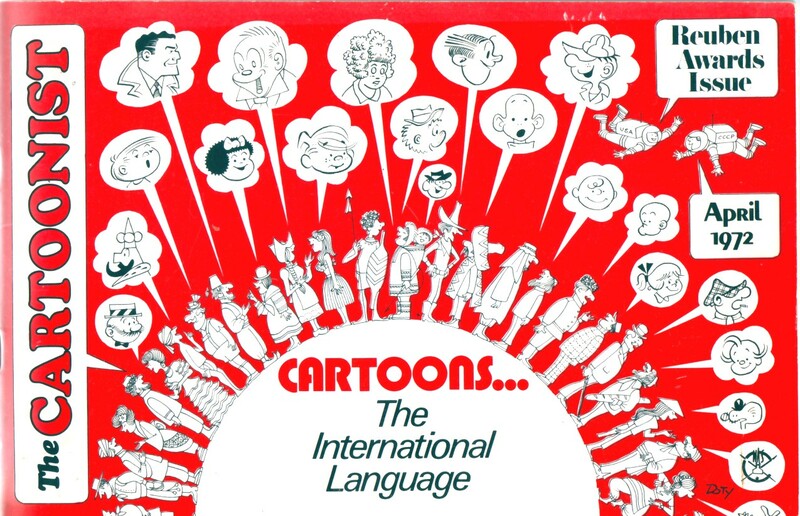 We talked about our love for the great cartoonist Orlando Busino! Orlando, if you're out there, were your ears buzzing this weekend? Jason Chatfield, Bunny Hoest and Anton Emdin. Table 17: Alexandra DiTuillio and Mengxin Li. My friends: NCS Award Winner (and one of that night's nominees) Sean Kelly and his lovely wife Megan. Two hard working guys: Mark Tatulli and Awards host Tom Gammill. Two reasons to buy books: NCS Award Nominee for his graphic novel MARKET DAY James Sturm and Jeff DIARY OF A WIMPY KID Kinney. NCS Gold Key winner Roy Doty and his entourage! Chari Pere, Sally Mitchell, Mell Lazarus and David Silverman. The big event: the Reuben Award. That fellow adjusting his glasses at the bottom of the photo is Richard Thompson. To the right of him, is Award presenter Mort Walker. Dave Kellett draws his experience of this past weekend's Reuben Awards. 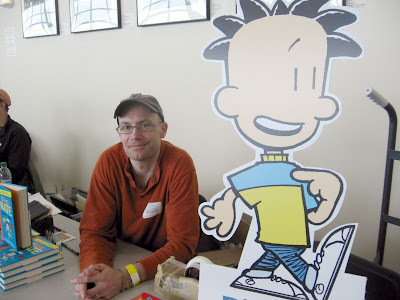 H/t to this year's Reuben Award winner Richard Thompson. 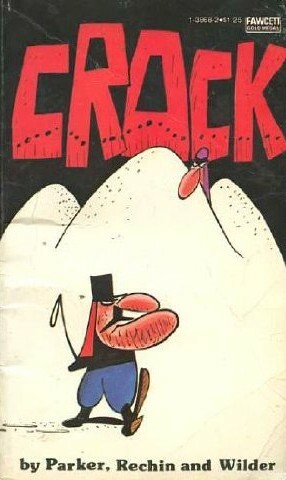 Above: Roy Doty drew the above cover for the 1972 Reuben Awards issue of The Cartoonist magazine, the in-house journal for the NCS. Isn't that a grand drawing? Roy will be honored Saturday night. 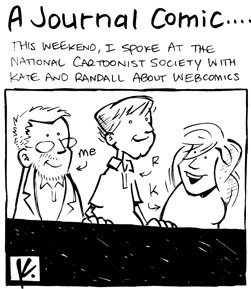 I'm away for the 65th annual National Cartoonists Society Reuben Awards weekend. No blogging until I return, OK? OK! 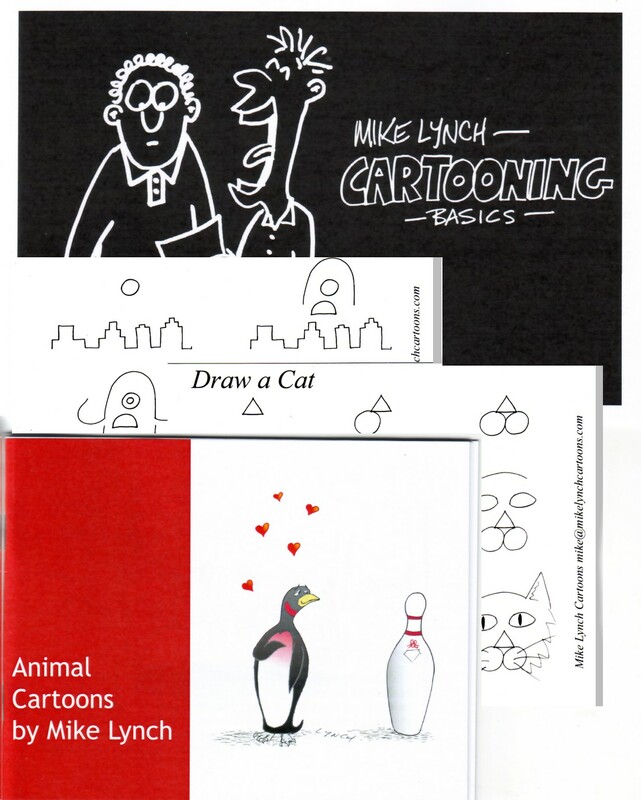 2 of my previously sold out books have been reprinted and are available together for a low price. This is a bargain. 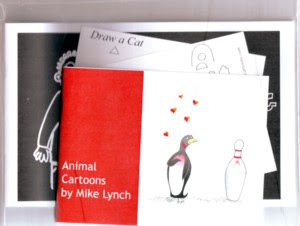 2 cartoon minis and 2 postcards for $7. 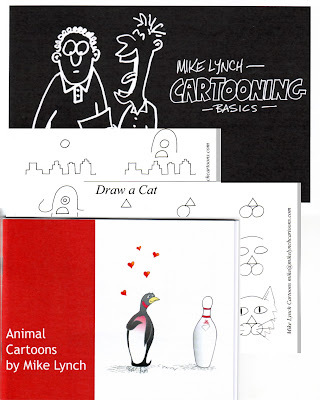 ... all bundled together, with an original gatefold sketch, for $7 postpaid in the United States. Above: Rick Parker's assemblage of drawing materials, plus his cool sunglasses, on his MECAF table. 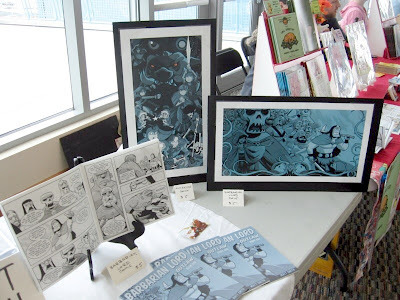 The third annual Maine Comics Arts Festival was held this past weekend in Portland, ME. Like every year, I was there, along with many other comics creators in the Seacoast area -- and beyond! 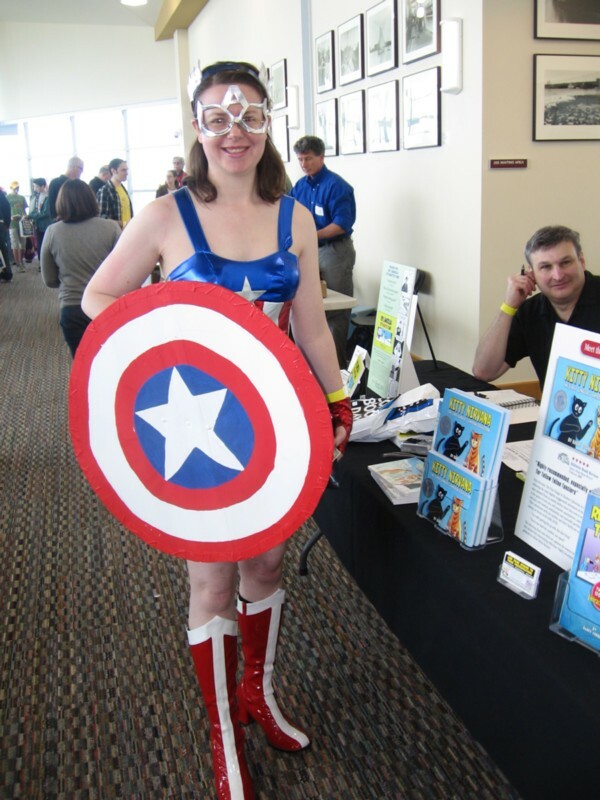 Rick Lowell of Casablanca Comics put this together, and thanks to his publicity prowess, the place was humming with fans and families visiting. Admission was only $5, but if you were a kid, you got in free. I shared a table with my pal John Klossner. 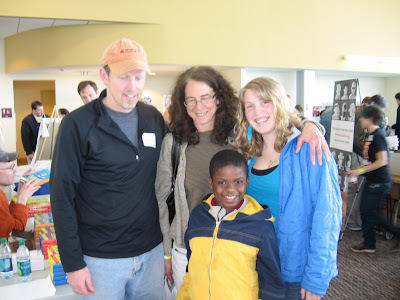 My friend John Klossner and his lovely family. Why the parent are looking down at their feet and the kids are looking at the camera I don't know. The famous guys at the table next to me and John: Lincoln Peirce and BIG NATE, one of the featured guests. 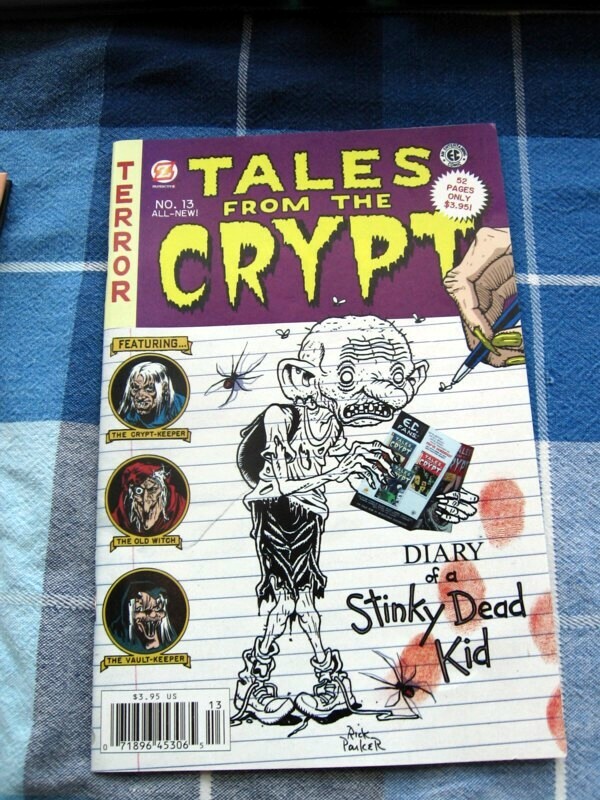 Rick Parker (of Paperkutz' DIARY OF A STINKY DEAD KID) draws for a fan. Corbett Features: the team of Brain Codagnone and Barry Corbett. Cara Bean and Matt Smith. Matt's BARBARIAN LORD comics and prints. Gorgeous work. 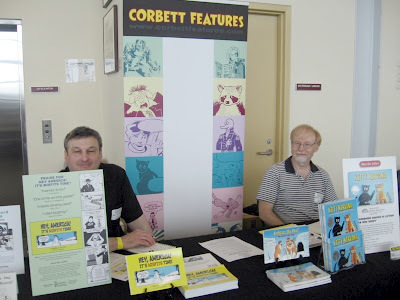 Marek Bennett and Colin Tedford's table. Busy, busy, busy! 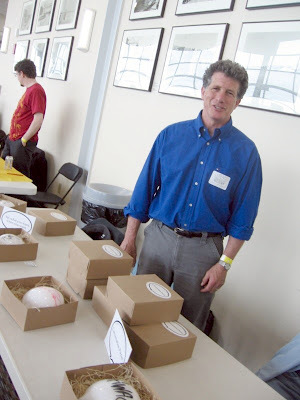 Glassblower and cartoonist David Jacobson of David Jacobson Glass! 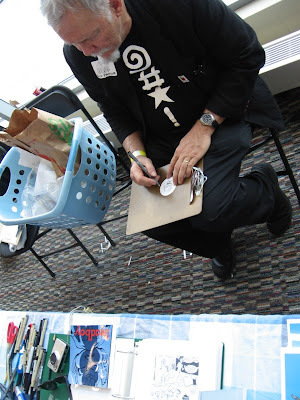 Check out his hand-blown "conversation pieces" word balloons! 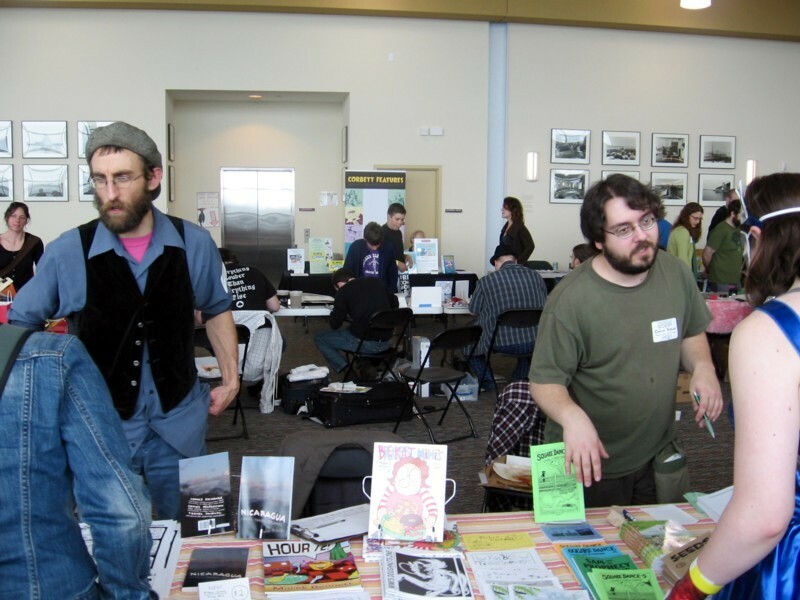 This is a busy, friendly convention, designed for the independent creators in the Seacoast area. My thanks to Rick Lowell for running a very smooth event. I had a great time. 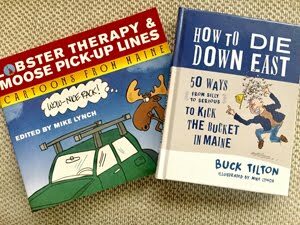 Bill Rechin, 80, a cartoonist known for the syndicated “Crock” strip, which parodies life in a Foreign Legion desert outpost, died May 21 at his home in Spotsylvania County [PA] of complications from esophageal cancer. 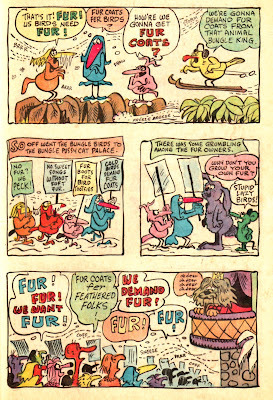 The Reynolds Unwrapped: The Cartoon Art of Dan Reynolds gallery show, is on now through July 10, 2011. 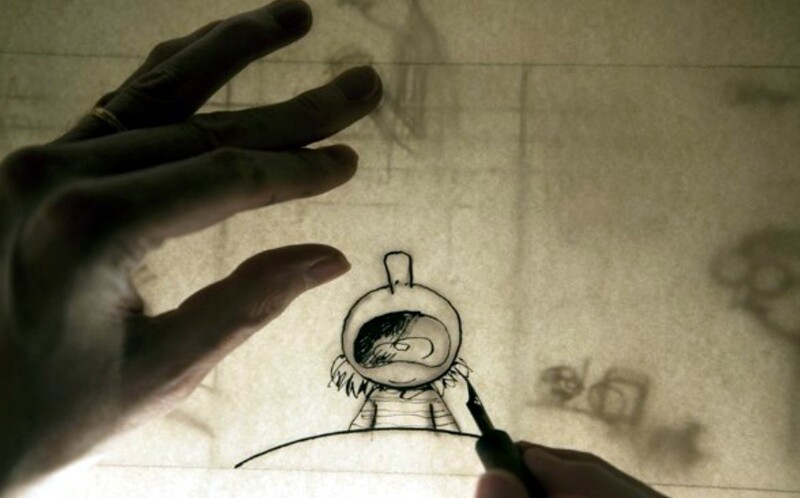 The Washington Post's Michael Cavna interviews CUL DE SAC creator Richard Thompson, "the last, best hope for the American comics page," with some comments by one of his fans, Bill Watterson. "'Where to start?... ' Watterson says in an e-mail. 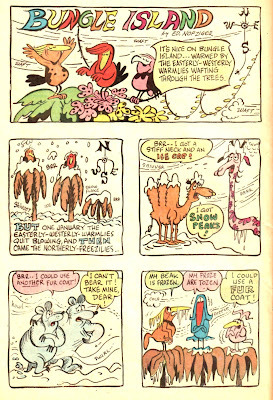 'The strip has a unique and honest voice, a seemingly intuitive feel for what comics do best ... a very funny intelligence ... the artwork, which I just slobber over. It’s a wonderful surprise to see that this level of talent is still out there, and that a strip like this is still possible.'" 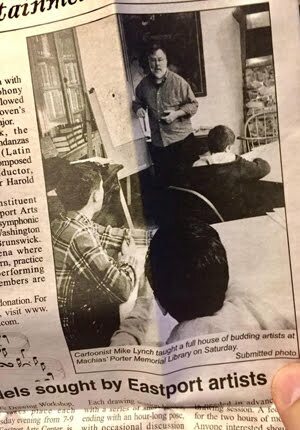 Above is from a Richard Thompson photo gallery. 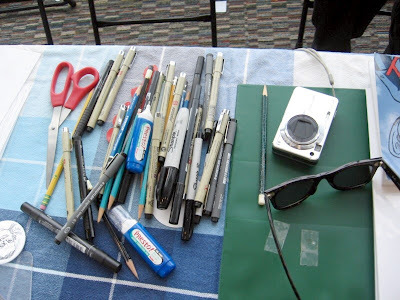 Video: Lynn Johnston "Conceiving April"
Here's a short, behind the scenes chat with cartoonist Lynn Johnston. This is one of a series of new videos that she is producing about FOR BETTER OR FOR WORSE. 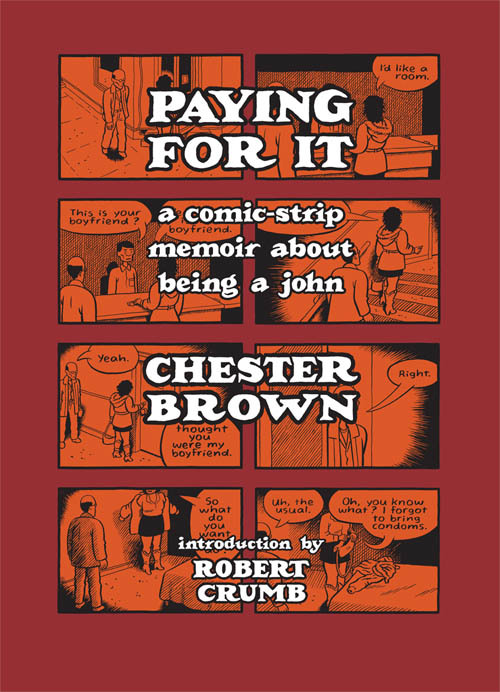 May 12, 2011: Chester Brown talks about his graphic novel PAYING FOR IT with Tracy Quan and Benjamen Walker at New York City's The Strand book store. 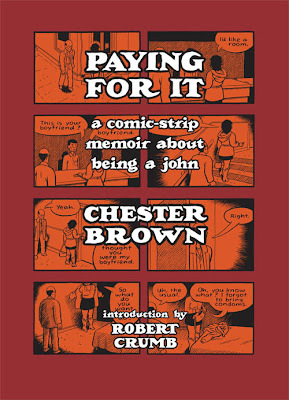 Graphic novelist Chester Brown talks about his new book PAYING FOR IT on Vancouver's Studio 4 TV with Host Fanny Kiefer. Those who think that LITTLE NEMO was unique would be wrong. 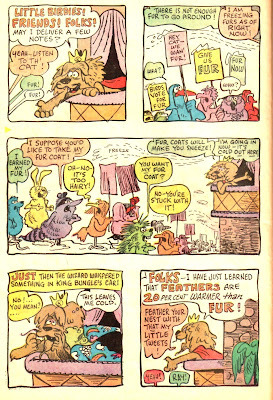 There were a large number of fantasy comic strips in the early part of the 20th century. FORGOTTEN FANTASY, a new book from Sunday Press Books, showcases over 150 of these fantastic Sunday strips from 1900-15. It will be released next month and there's a discount if you order now. 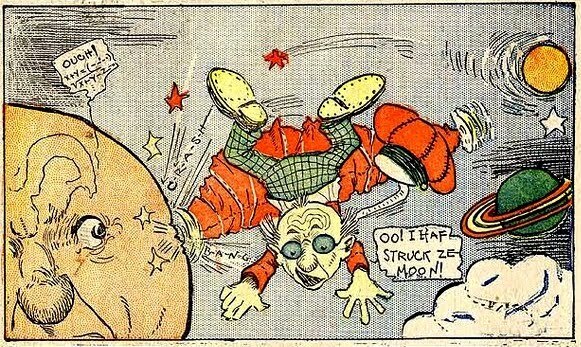 with complete runs of The Explorigator, Naughty Pete, George McManus's Nibsy the Newsboy, and full-color selections of Winsor McCay's Dream of the Rarebit Fiend and Tales of the Jungle Imps. 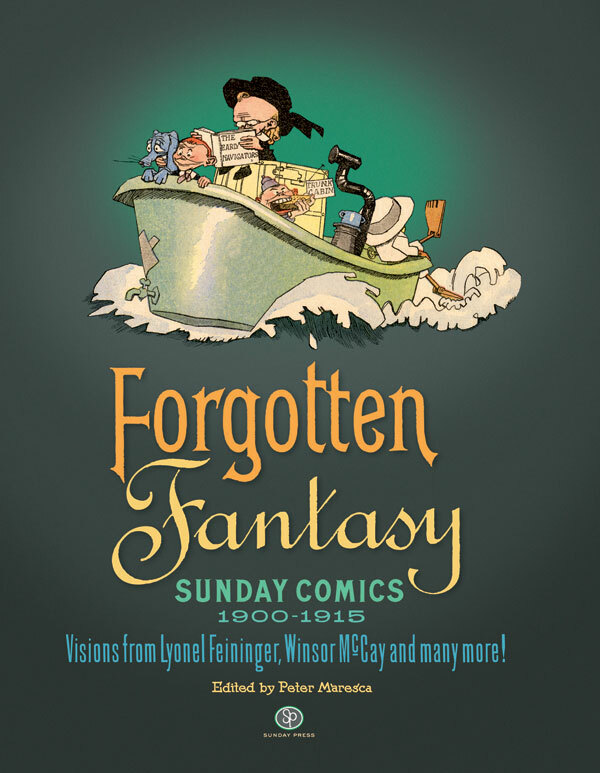 PLUS dozens fantastical comics by the greatest fantasy cartoonists of the age. 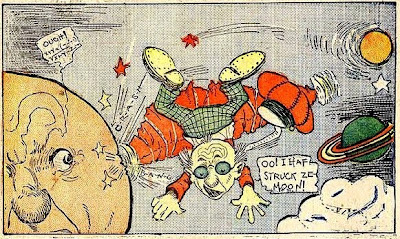 PROFESSOR WAYUPSKI by Albert Bloch, which ran for a short time in 1902 in the St. Louis Dispatch, was one of many. The Stripper's Guide has more here. Via Need to Know on PBS. 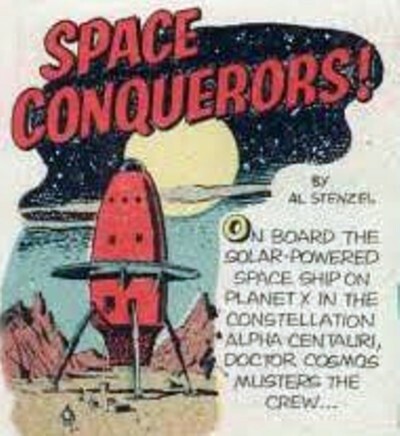 My friend Ger Apeldoorn shows us a 1955 run of SPACE CONQUERORS!, a long-running strip in the Boy's Life magazine. He shares links to compete on-line run of Boy's Life as well! 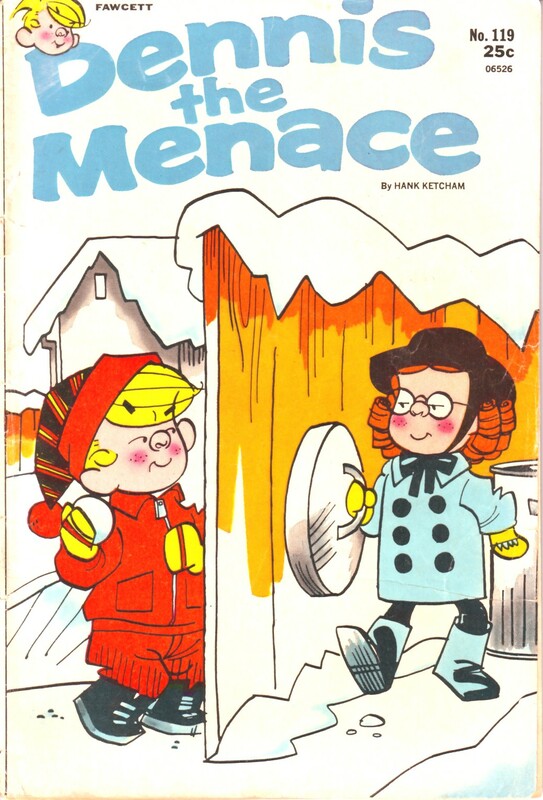 Above: the unsigned cover of DENNIS THE MENACE #119 drawn by one of Ketcham's assistants. 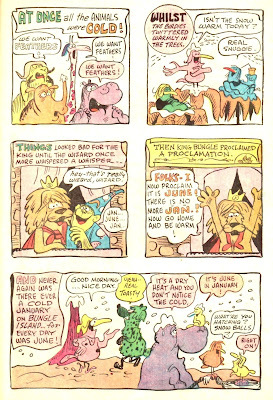 Smack dab in the middle of DENNIS THE MENACE #119 (March 1972 issue) is a 4 page feature titled "Bungle Island" by veteran cartoonist Ed Nofziger. 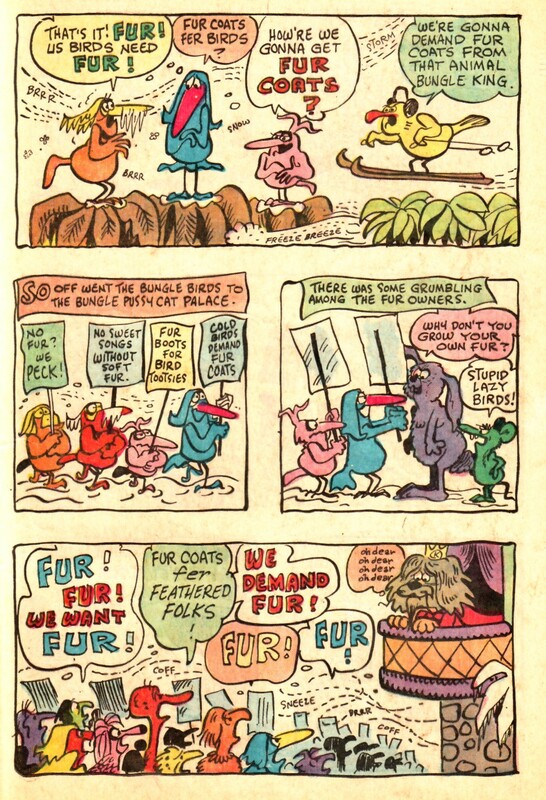 If you ever wanted a cartoonist to draw an animal, it would be Nofziger. Ed Nofziger worked in animation (UPA, Disney, Hanna Barbera) and gag cartoons (The New Yorker, Saturday Evening Post, among many others) and comic strips during his long career. 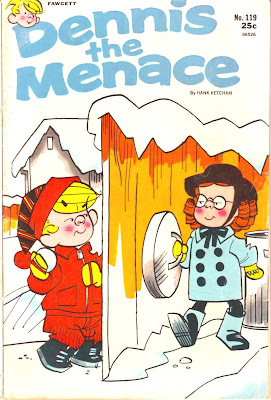 He wrote scripts for Disney comics, but I had never heard of Bungle Island until I had purchased this Dennis the Menace some 39 years later from a long box at Jetpack Comics. 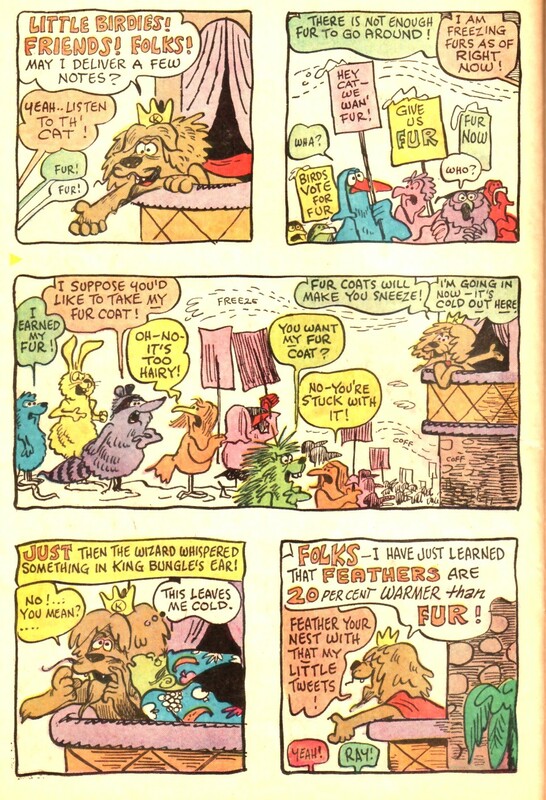 All I can find out about "Bungle" is that it was a sometime feature in Fawcett comics from 1969 to 1975. 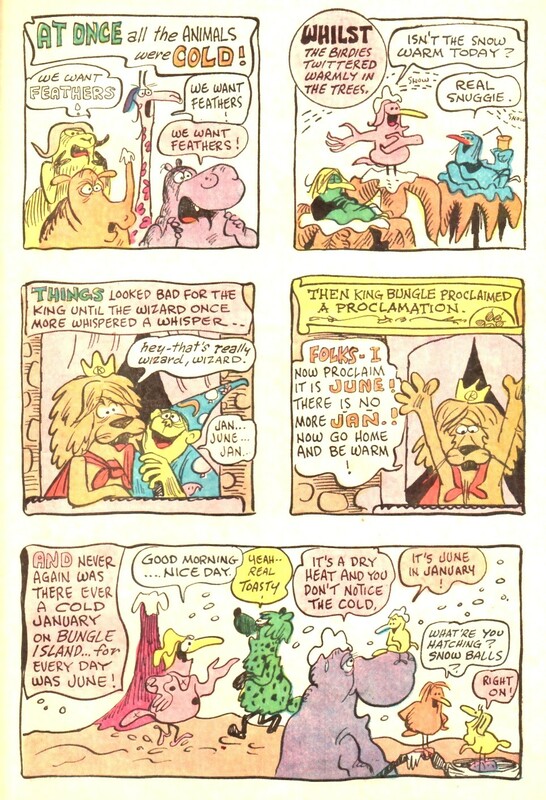 You can see the easy, breezy way that Nofziger draws all of these animals, who are presided over by King Bungle, a lion, complete with red cape and gold crown and a green ape-like wizard advisor.